So beautiful. I would love to know what he’s thinking. Photo taken in the Okavango Delta, Botswana. This entry was posted in Travel Photos and tagged 50 Year Project, Africa, Animal Photography, Animals, Blog, Blogging, Botswana, Life, Lions, Nature, Okavango Delta, Photography, Travel, Travel Blog, Travel Journal, Travel Photo, Wildlife, Wildlife Photography. Bookmark the permalink. He’s thinking, “Mmmm, that antelope looks yummy, but I’m too tired to go and chase it”. He’s thinking “I hope she’s got my good side”! Yikes. I better watch out! Lunch. 🙂 He is handsome. Lovely shot – the light makes him look softer. Which part of the delta did you spot him in? We were staying at the camp Pom Pom. I copied their description here: The Camp is located on Pom Pom Island in a private concession situated in the heart of the Okavango Delta and on the head waters of the Xudum river system. The area lies on the western boundary of the Moremi Game Reserve and offers superb Okavango scenery and a true Okavango wilderness experience. Hope that helps! We went to Chobe as well and it was amazing. But I’m with you, any place in Africa is amazing. 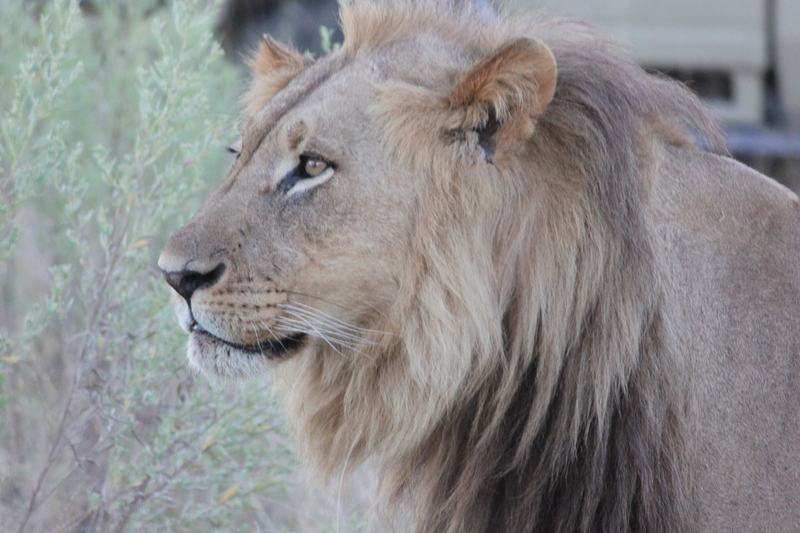 We saw more lions outside of Pom Pom, but we did see two females and one male in Chobe. To be honest, it’s hard to say which area I liked more. I loved our guide in Chobe more, but the guide at Pom Pom grew on me. he was more shy. Dan, our guide in Chobe, was just as excited to see the animals as we were. That made it fun! And he knew so much. 15 vehicles seems like a lot–how did the animals react to that? While at Pom Pom there were two vehicles and most of the time we were in different places. The poor land and animals. Sadly I think they are simply accustomed to it. The post I put up recently about safari ettiquette says a lot. Much nicer and better for the environment and animals if its more personal. Are they putting a highway through the Serengeti? Oh boy, not sure how I feel about that. That’s the plan 😦 There are groups trying to prevent it but as with most things in Africa if theres enough money behind it then it will go ahead regardless. Such a shame. The poor animals and land. Just reading through the above comments – putting a highway through the Serengeti! How outrageous – not really what the whole experience is about surely. I suppose that will be followed by highway cafes, motels and tourist shops!!!!! Nooooooooooooooo. Stop it now. I’m not for it either. Seriously, it will do more harm than good. I just hope he wouldn’t be thinking of having me for lunch.